This was my surprise waiting for me in the garden. Every time I screamed, it would slither off into the woods. I would then run into the house, gather my courage and slowly go back outdoors. There it would be–back in the same place in the garden. We completed the same screaming, running, returning cycle about three times. Remember, I don’t really like critters. Remember the beaver, the chipmunks, the birds? Why is God doing this to me? The Garter snake is a Colubrid snake genus (Thamnophis) common across North America, ranging from Alaska and Canada to Central America. It is the single most widely distributed genus of reptile in North America. 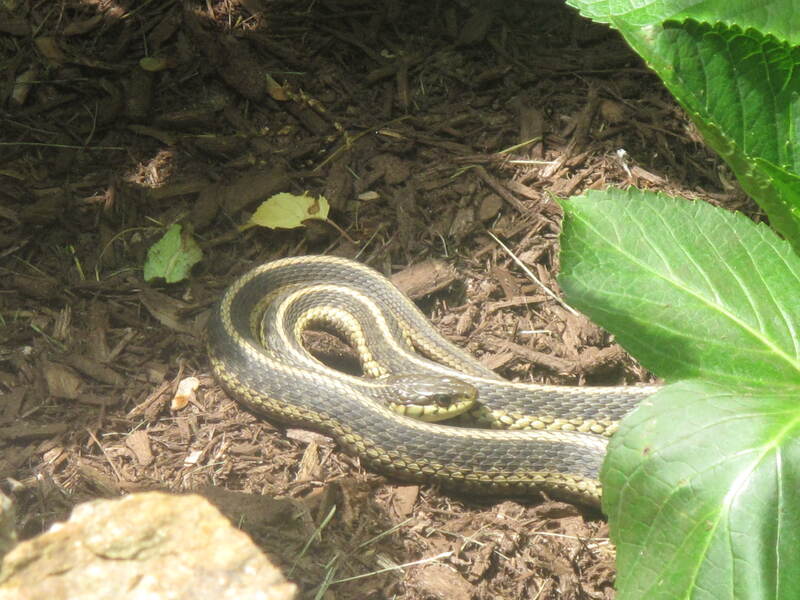 The garter snake is also the Massachusetts state reptile (I no longer like Boston). Garter snakes are widespread throughout North America. The common garter snake (Thamnophis sirtalis) is the only species of snake to be found in Alaska and is believed to be one of the northernmost species of snake in the world. The genus is so far ranging due to its unparticular diet and adaptability to different biomes and landforms, with varying proximity to water. Garter snakes, like all snakes, are carnivorous. Their diet consists of almost any creature that they are capable of overpowering: slugs, earthworms, leeches, lizards, amphibians, birds, fish, toads and rodents (thank God that Yorkies weren’t on the list!). When living near the water, they will eat other aquatic animals. Food is swallowed whole (similar to how several of my friends eat). 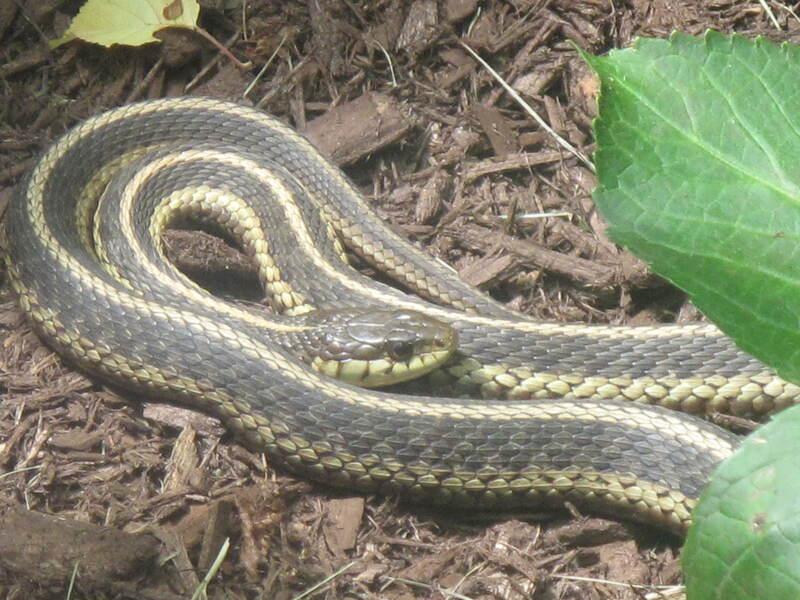 Garter snakes often adapt to eat whatever they can find, and whenever, because food can be scarce or abundant. By the end of the day, Lenny had slithered off and I didn’t see him again. I know he is out there, but I haven’t seen him. As long as he is out there eating mice and bad bugs, I’ll get used to knowing that a garter snake slithers among us here at Glen Road. I don’t like it, but I’ll get used to it. I mean, it’s not like Mother Nature issues restraining orders. I’m calm now. I’m going outside to pull the ‘For Sale’ sign out of the front lawn. Do you have any ideas on how to keep snakes as far away as possible from you, your house and your garden? This entry was posted in Nature and tagged Acorns, Blog, Fun, Gardening, Humor, Life, My Life, Nature, Photos, Spring. Bookmark the permalink. Thanks for the laugh! I’m not laughing at you remember, just maybe a little in your direction. I hope no birds pooped anywhere near you in your mad dash to escape. Hi Rufus’. Why can’t animals understand that I am not good around them? I think that they are working together to make me nuts. What’s next…a grizzly, a giant bat, an alligator? That’s why I lived in the concrete jungle for so long. Hi Dianna. Thanks for the suggestion. Not good for the heart…that is for sure. May the snake look at me from far away. The best idea I have in keeping the snake from coming back is to KILL IT. I know animal lovers are going to hate me but I can handle that more than I can to be around a snake. We won’t give the animal lovers your home address, Carolkin.